Since Monday is Presidents Day and George Washington's Birthday, I thought we would do a little art project today to celebrate. For some reason when I saw this coloring page, I thought it would be cool to use to create a little Andy Warhol inspired art. We haven't been doing many fun projects this week because we are recovering from our vacation to Newport Beach last week (laundry, cleaning, unpacking, etc.). I decided we needed a break... and painting is always a favorite activity! I also give my son limited use of the water or talk with him about only dipping the brush when it looks "thirsty" (dry lines on paper). We talk about not drowning the brush (using too much water) as well ... since then there is very little color on the page and lots of liquid. If we had watercolor paper, that would work the best, but we didn't today... so we just used regular printing paper and tried not to rub it too hard. 3. Let the paint dry. While the paint dried, we inaugurated my son as "Mr. President." He was in charge for about two hours. We started off the fun by making laws. The Congress (me) vetoed a few of his ideas (ie, "No baby Caitlin in my room"). He got to make our schedule and decide what was for lunch. I was assuming he'd say "ice cream," but he actually asked for chicken nuggets... which is better than his usuaL, "I WANT NOTHING, NOTHING, NOTHING!" Maybe he'll have to be President more often. During his time in office we played a lot of volleyball and soccer. 4. Once the paintings are dry, cut them out. 5. Tape or glue them to colorful paper. I cut my paper down to fit the pictures. 6. Tape them together and display them Andy Warhol style. I showed my son some of Warhol's other colorful prints. We didn't do any printmaking today... but we tried to use Warhol inspired color and format. 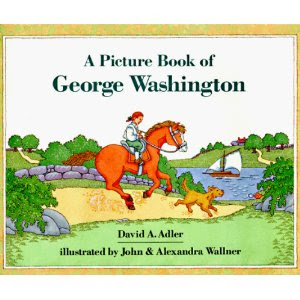 You can round out this activity by reading David Adler's A Picture Book of George Washington. Have a great President's Day weekend! I was just thinking about President's Day and was browsing on the internet for some ideas!!! Thanks for sharing this. Great idea, so glad I found it via Pinterest! Doing this today! Such a fun idea!